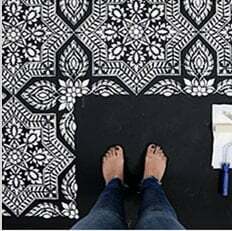 Tile Stencils - Stencil your old tile floor or backsplash with Tile Stencils! Cement tiles are all the rage in today's decor, but they are expensive and difficult to install. Luckily for a DIY enthusiast, we offer amazing tile stencils for floors, kitchen backsplashes and furniture! Now you can get that pinterest-worthy cement tile look for a fraction of the price of real tile. Our trendy Amalfi tile stencil features built-in registration for easy stencil alignment, and also comes with a free grout line stencil. The most trendy color combos include soft greys and taupes and also variations of traditional deep blue color. Use stencil brushes for a multi-color look, or simply roll with a dense foam roller for a monochromatic effect. This stencil will definitely make a statement in your space!